German currency used during World War II. 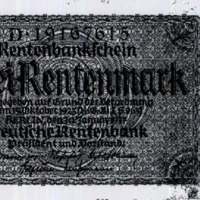 The Reichsmark (ℛℳ) was the currency used in Germany and its colonies from 1924 to 1948. This bill was likely used by Sergeant John B. Hancock (1913-1944), an American soldier. Digital reproduction of photocopied bill. “German Currency During World War II.” RICHES of Central Florida accessed April 19, 2019, https://richesmi.cah.ucf.edu/omeka/items/show/9315.